In January 1959, ten experienced young skiers set out for Mount Otorten in the far north of Russia. While one of the skiers fell ill and returned, the remaining nine lost their way and ended up on another mountain slope known as Kholat Syakhl (or 'Mountain of the Dead'). On the night of 1st February 1959 something or someone caused the skiers to flee their tent in such terror that they used knives to slash their way out. Search parties were sent out and their bodies were found, some with massive internal injuries but with no external marks on them. The autopsy stated the violent injuries were caused by 'an unknown compelling force'. The area was sealed off for years by the authorities and the full events of that night remained unexplained. 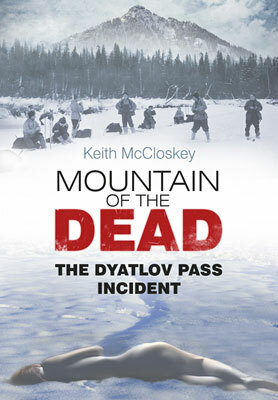 Using original research carried out in Russia and photographs from the skier's cameras, Keith McCloskey attempts to explain what happened to the nine young people who lost their lives in the mysterious 'Dyatlov Pass Incident'. is an update regarding my trip to the Dyatlov Pass. On November 17th 2013, I appeared on the Coast to Coast AM Radio Station in America. In just 4 days my 2 websites received over 10,000 new visitors. broadcasting on the National Geographic Channel from November 2014.